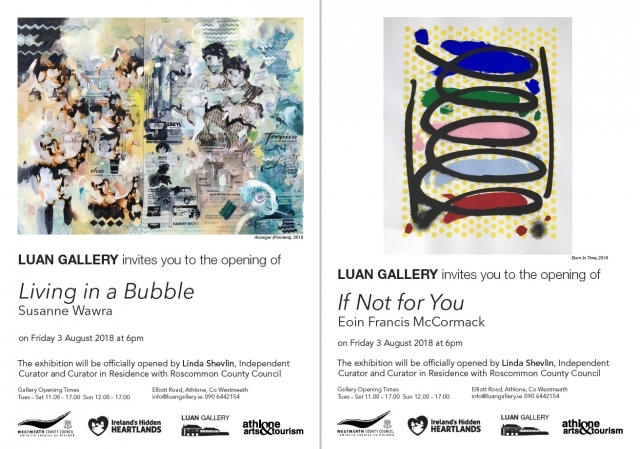 Luan Gallery is delighted to present the work of two renowned artists Eoin Francis McCormack and Susanne Wawra concurrently for the months of August and September 2018. If Not For You by Eoin Francis McCormack will feature in the New Gallery while Living in a Bubble by Susanne Wawra will be shown in the Library and River Gallery spaces. Athlone based Eoin Francis McCormack uses the idea of 'artist as maker' as a catalyst for his work. Utilising fabricated tools and self mixed paint, he translates this idea into form. His work also explores the particular challenges posed by the process of interpretation in contemporary visual art. The artist wonders if work produced in the quiet of the studio has the potential to make an impact on an audience once presented to the public. McCormack holds a BA in painting from Limerick School of Art in 2010 and an MFA in Contemporary Art Practice from Edinburgh College of Art, Scotland in 2014. Susanne Wawra is a German artist based in Dublin. Working across different media, Susanne explores the intersection between personal autobiography and historical events. Utilising photographs from her own family albums, Wawra draws on printed matter to interrogate her experience of growing up in East Germany before the fall of the Wall. Her use of mundane source material combined with the layered process of collage enables a material reimagining of the tension between fiction and reality, past and present. Wawra is a Painting graduate of NCAD. Susanne has been named as one of the four artists of "50 People to Watch in 2017" in The Irish Times. "I'm really excited to launch this exhibition of work by two extremely talented painters. While Susanne's work draws on her own personal experiences of growing up in East Germany, Eoin takes the juxtaposition of painter/worker as a concern. It's this variation of themes and source materials that will make this a very dynamic exhibition." The exhibition was officially launched by Linda Shevlin on Friday 03rd August. Linda is an independent Curator and Curator in Residence with Roscommon County Council. The exhibition will continue until 29th September. Luan Gallery is open Tuesday – Saturday 11.00 – 17.00 and Sundays 12.00 – 17.00. Admittance to Luan Gallery is free of cost and guided tours are available to all at no cost.